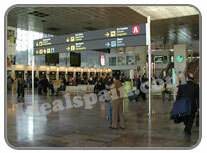 Barcelona airport has the airport code BCN and is commonly known as El Prat Airport. It is located just 10km (6 miles) southwest of the city centre. Barcelona airport is the second largest airport in Spain. Second only to Madrid International Airport. The airport in Barcelona serves Catalonia and the Mediterranean coast, Costa Brava. The airport is the main hub in Spain for Spanair, Vueling Airlines and Iberia Airlines. Worldwide and internal flights leave and arrive daily. The airport was once famous for the Barcelona to Madrid air shuttle service although this has now been reduced and replaced by the high speed train. The El Prat airport opened in 1918 when it was used to house the Spanish Zeppelin fleet and the Catalonia Aeroclub. The first commercial flights began in 1927 when Iberia began flights to Madrid. The biggest mark in the history of Barcelona airport was in 1992 when massive improvements were made to cope with the summer Olympics. Terminal B was expanded and terminals A and C were built. Nowadays, Barcelona Airport handles mainly internal and European flights although the Catalan authorities are always applying pressure to try to open new intercontinental gateways. More expansion took place in 1999 and even more is planned for the near future. The airport currently handles over 55 million passengers annually. The airport has all the facilities you would expect from a world leading airport. There are banking and foreign exchange facilities, a business centre on the first floor of terminal B, shops in all terminals, cafes and restaurants and pharmacy and medical facilities. There are 26 wireless Internet access points located in the restaurant area, the VIP lounge and the meeting room areas. Travellers with WiFi laptops or PDA's will now be able to enjoy wireless Internet access at Barcelona Airport, provided by the concession granted to the Temporary Joint Venture, Kibiwireless-Comunitel-Vodafone. For any queries, contact the technical service on telephone 902 195 788 or E-mail ayuda@kubiwireless.com. Barcelona has 26 connection points distributed around the three terminals. Terminal A: Medas Ready to Eat (public area), Self Mediterráneo (M4), Caffe di Fiore (M5), Terracotta (M5), Pans&Company (M5) and Salvador Dalí VIP lounge (M5). Terminal B: Ars (public area), Plantaciones de Origen (public area), Pans&Company (public area), Buffet Catalunya (public area), Restaurant Sant Jordi (public area), Aubépain (M2), Tip Top Tapas (M2), Medas Beer (public area), The Food Gallery (M2), Europa (M3), La Pausa (M3), Caffe di Fiore (M3), Fresh and Ready (Rambla), Canudas VIP lounge (M2) and Catalunya Meeting Rooms (M2). Terminal C: Caffe di Fiore (M0), Medas Restaurant (M1), Medas Beer (M1), Medas Beer (public area) and Medas Ready to Eat. Taxis from Barcelona airport to the city take around 30 minutes and cost around 25€. Taxis are all official, government authorised. The train station at Barcelona airport is very easy to find. From the terminal buildings, walk over the long overhead bridge between terminals A and B. Trains to Barcelona run every half hour and the journey only takes 30 minutes. The price is just over 2 euros. There is a shuttle bus service which stops outside each terminal and goes to central Plaça Catalunya every 15 minutes. This is the easiest way to travel to the city centre and costs just over 3 euros. There is also a rapid bus service from the airport to several major cities such as Girona, Reus, Lleida and Tarragona. As with all major airports in Spain, Barcelona has an excellent range of companies offering car rental. You will find all the major companies here such as Avis, Hertz, Budget, Sixt and National. The car companies have desks at the airport but you are advised to make your reservation before you arrive. A secure, online booking will save you a long queue at the airport and ensure that your car is ready when you arrive. During summer peak times rental cars can be in huge demand. Booking your car when you arrive at the airport can result in paying premium prices. All companies offer a wide range of cars from small compacts through to luxury and people carriers. Cars can be rented at Barcelona airport for as little as one day or for as long as you like. If you plan a short visit to Barcelona, hiring a car could work out cheaper than a few taxi rides and driving from the airport is relatively easy. The access road to the airport is the C-31 Barcelona-Castelldefels dual carriageway. It connects with the C-32 Barcelona-Sitges road. A great deal of thought has been put into the design of Barcelona airport when it comes to disabled passengers. Most areas are accessible with little trouble. All parking areas have specially marked, wide bays for disabled use. All accesses to the terminals have wheelchair ramps. Barcelona Airport has car parks at Terminals 1 and 2, plus a long term car park some distance away. Parking works out at roughly €18.30 per day but reduces after five days. In total the airport has over 23,000 parking spaces. All parking areas are manned by security guards. To access parking areas, collect a ticket by pressing the button on the ticket machine. Do not park outside marked bays as the tow truck will remove your vehicle very quickly and you will have a large fine to pay. Once you have parked your vehicle, do not leave any valuables in sight. Especially remove all SatNav equipment, including windscreen mounts. Make a note of your parking bay number (write it on the back of your ticket). On returning to your vehicle, pay for your parking first at one of the payment machines. You then have 20 minutes to exit the car park. If you have any problems exiting or have lost your ticket, simply go to the information desk. If your car battery is flat when you return to your car, the car park staff will start the car for you, free of charge. There are two parking garages, an open-air car park and a VIP parking area at Terminal 1. The multi-level parking garages are close to the terminal and connected by covered walkways. The open-air car park is slightly further away. Terminal 2 has several car parks close to the terminal. There is a large car park located across the access road from Terminal 2B. Terminals 2A & 2C have their own covered car parks close by. The Long Stay car park is some 2 km from the terminals. Follow the Larga Estancia (Long Term) signs as you approach the airport. There is a frequent free transfer bus between the Long Term car park and the terminals. There are VIP Parking areas at each terminal. Parking spaces for users with disabilities are located in each car park close to terminal access routes.